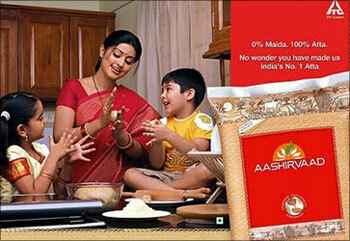 Way back in 2002, when ITC launched Aashirvaad packaged wheat flour, it was a latecomer to the branded atta market. HUL, with Annapurna and General Mills, with Pilsbury had beaten it by a clear couple of years. Soon however, within four years says the company, the brand had edged past its peers to corner the maximum market share. Today Aashirvaad, ITC says, has 75 per cent of the market -- of course, given that wheat in India still is a largely unorganised market, the branded segment is a tiny fragment of the whole. Its main competitor is Shakti Bhog atta followed by Annapurna and Pilsbury. ITC is hoping to follow the path that Aashirvaad took to get to the top spot for the rest of its branded foods business. For wheat flour, the organised segment in India is estimated at Rs 3,500 crore (Rs 35 billion). This is mere fraction of the Rs 30,000 crore (Rs 300 billion) atta business in the country. In most parts of the country, flour is still a homegrown affair. Wheat grains are bought in bulk and ground at the local millers; it took aggressive marketing, deep pockets, an extensive rural network and a team of researchers working closely with the product teams for ITC to break this mindset. The learning is being used to bring out a range of dairy products (ghee has been launched in Karnataka) and to power new lines of fruit juices and drinks. It has also been used to brand a range of extensions (wheat atta, atta with multigrains, atta with methi, salt and fortified Atta), spices (pickle mirch powder, chilli powder, coriander powder and turmeric powder), instant mixes (gulab jamun, ravi idli, rice idli and rice dosa) and ready meals. Even though the foods business is still small, compared to ITC’s total turnover, the company seems to be intent on spreading the brand’s reach and significance within its portfolio. Two key food brands in the ITC portfolio are Aashirvaad and Sunfeast. Together they account for more than half the division’s sales revenues. The other brands in the portfolio are Bingo!, Yipee!, Kitchens of India, minto-o, B Natural, Candyman and Gumon. The Aashirvaad route is being taken for the company’s B-Natural brand of fruit juices. An urban brand was sought to be built upon the company’s rural edifice and then expanded into small towns and rural markets. Aashirvaad leveraged the multinational’s deep linkages with the farmers and that has paved the way for many more linkages and brand extensions. Rajesh said that ITC’s peers do not have this advantage; neither do they possess the massive distribution network that it has built through its core businesses. ITC’s distribution network reaches more than two million outlets nationwide and more than 4.5 million stores through wholesalers. In March this year when Y C Deveshwar, chairman of ITC said that in the next 15 years the company would run a Rs 1,00,000-crore (Rs 1,000 billion) FMCG business, he set tongues wagging. While many saw it as a way to step away from the company’s highly taxed and increasingly unglamorous tobacco business, others scoffed at the numbers. However, skepticism is the luxury of bystanders. Rajesh said that the foods business will be a significant contributor towards this goal and Aashirvaad has a significant role to play in this. The company has targeted close to a billion dollars’ worth of business in the next five years from its food brands. In 2014-15, the business posted revenues of Rs 6,411 crore (Rs 64.11 billion). According to Rajesh, Aashirvaad has consistently innovated with taste, form and marketing methods and has successfully straddled the premium and mass market. The secret to this, he says, is research, research and more research. Rajesh believes that the special blends and granulations that the team has crafted, since the launch, for different markets have contributed to its success. “The product is customised for different sets of consumers across regions. In the North, atta is consumed daily, and the look and granulation required there would be different,” said Rajesh. Harish Bijoor, CEO of Harish Bijoor Consults said, “ITC is a corporate brand whose mother brands are Sunfeast and Aashirvaad, which is all about staple foods. He cites the example of Britannia Industries as another company that has managed to do the same. ITC is looking to take the Aashirvaad-Sunfeast brand duo into chocolates and value-added dairy products. Aashirvaad Svasti Ghee currently in Karnataka will be expanded in the South and then pan-India. It is also setting up integrated consumer goods manufacturing and logistics facilities in West Bengal, Tamil Nadu, Punjab, Maharashtra and Telegana. Last year the company had invested around Rs 3,000 crore, including Rs 1,400 crore (Rs 14 billion) in Punjab alone. The facilities are expected to do away with supply chain inefficiencies and help take the brands into distant corners of the country. On paper, the plan seems to be perfectly set out but the challenge, apart from managing the vast portfolio of products, will be fending off competitors. Since Aashirvaad and Sunfeast operate in a commodity category, Bijoor says, they will always be operating under pricing pressure. Rajesh says the only way out is innovation. The R&D facility, the ITC Life Sciences and Technology Centre at Bengalaru, has filed over 351 patent applications in the area of agri-business, forestry, food and consumables. Carlos Brathwaite, new star in making?